Shakespeare's School Days: What Did Shakespeare Read in Grade School? Shakespeare's School Days: What Did Shakespeare Read? It abounds with references to the course of instruction in the Wakefield grammar school when the author was a pupil there under a master who presided over the school for upwards of fifty years. Hoole gives, at the beginning of the work, a list of the books generally used in the grammar schools of the country, and towards the end, as I have said, the course of instruction established in Rotherham School before he became head-master. These valuable details carry us back to Shakespeare's time; and as they agree, where comparison is possible, with the statements of Brinsley, as well as with the scraps of information to be derived from the early school charters and ordinances, we may accept them as a guide to the course of instruction at Stratford. Even apart from this, we may be sure that whatever was generally true of country grammar schools in the early decades of the seventeenth century would be true of them in the later decades of the sixteenth. Public schools, as a rule, are about the most conservative of human institutions so much so that, except at distant and revolutionary intervals, the introduction even of a new class-book is a work of extreme difficulty. The Public School Commissioners who sat in 1862 found that the lines of instruction laid down in the sixteenth century remained practically unchanged till within the memory of the present generation. The only considerable change that took place between Shakespeare's school days and those of Hoole was in the more general teaching of Greek, as a regular branch of school instruction. Leaving, however, his "less Greek," I shall confine myself to the "little Latin" which, according to his friend and fellow-dramatist, Shakespeare possessed. And on this head we may confidently assume that the course of instruction established at Ashby, at Wakefield, and at Rotherham would also be found established at Stratford-upon-Avon. To save space, I shall give only the list of books and authors commonly read in the grammar schools. The first form is occupied with the accidence and the "Sententise Pueriles"; the books in use in the second form were "Lily's Grammar," Cato's "Maxims," "Pueriles Confabulatiunculae," and the Colloquies of Corderius; in the third form, in addition to the grammar and Latin Testament, Aesop's Fables, the Dialogues of Castelio, the Eclogues of Mantuanus, and the Colloquies of Helvicus; in the fourth form, in addition to the Testament and grammar, the "Elements of Rhetoric," Terence, "The Selected Epistles of Cicero," Ovid's "De Tristibus," and "Metamorphoses," and Buchanan's Psalms; in the fifth form, in addition to the "Elements of Ehetoric," Livy's Orations, Justin, Caesar, Florus, the Colloquies of Erasmus, and Virgil; in the sixth form, Horace, Juvenal, Persius, Lucan, Plautus, Martial, Cicero's Oations, and Seneca's Tragedies. The list of authors in the sixth form is rather a long one; but it would seem that while Horace, Juvenal, and Persius were thoroughly read, the others were only read in selected portions. On this point Hoole says, in his own detailed account of the work in this form: "As for Lucan, Seneca's Tragedies, Martiall, and the rest of the finest Latin poets, you may do well to give them a taste of each, and show them how and wherein they may imitate them, and borrow something out of them. Mr. Farnbie's notes upon them will be helpful; and Pareus or Taubman upon Plautus will make that some merry comedies of his may be easily read over". "That none may censure this Discovery which I have made to be an uncouth way of Teaching, or contrary to what had been afore-time observed by my Predecessors of Rotherham School (which is the same that most Schole-Masters yet use), I have hereto annexed their method, just as I received it from the mouth of some Scholars who had been trained up therein all their time at that Schoole and hence sent to the University; before I came hither to be master. "The custom was to enter boyes to the Schoole one by one, as they were fit for the Accidents and to let them proceed therein severally, till so many others came to them, as were fit to be ranked with them in a form. These were first put to read the Accidents, and afterwards made to commit it to memory; which when they had done, they were exercised in construing and parsing the examples in the English Rules, and this was called the first form: of which it was required to say four Lessons a day: but of the other forms, a part and a Lesson in the fore-noons, and a Lesson onely in the after. "The second form was to repeat the Accidents for Parts; to say fore-noons Lessons in Propria quae maribus, Quae genus, and As in praesenti, which they repeated memoriter, construed and parsed; to say an after-noon's lessone in Sententiae Pueriles, which they repeated by hart, and construed and parsed; they repeated their tasks every Friday memoriter, and parsed their Sentences out of the English. "The third form was enjoyned first to repeat two parts together every morning, one out of the Accidents and the other out of that forementioned part of the Grammar, and together with their parts, each one was made to form one person of a verb Active in any of the four Conjugations: their fore-noons Lessons were in Syntaxis, which they used to say memoriter, then to construe it, and parse onely the words which contain the force of the Rule; their fore-noons lessons were two dayes in Aesop's Fables, and other two dayes in Cato; both which they construed and parsed, and said Cato memoriter; these Lessons they translated into English, and repeated all on Fridayes, construing out of the Translations into Latine. "The fourth form having ended Syntaxis, first repeated it, and Propria quae maribus, etc., together for parts, and formed a person of a verb Passive, as they did the Active before; for Lessons they proceeded to the by-rules, and so to Figura and Prosodia; for after-noon lessons they read Terence two dayes, and Mantuan two dayes, which they translated into English, and repeated on Fridayes, as before. "The fifth form said one part in the Latine, and another in the Greek Grammar together; their fore-noons Lessons was in Butler's Rhetorick, which they said memoriter, and then construed, and applyed the example to the definition; their after-noons Lessons were two days in Ovid's Metamorphosis, and two days Tullie's Offices, both which they translated into English; they learned to scan and prove verses in Flores Poetarum, and repeated their week's works on Fridayes, as before. "The sixth form continued their parts in the Greek Grammar, and formed a verb Active at every part; they read the Greek Testament for fore-noons Lessons, beginning with Saint John's Gospel; their after-noons Lessons were two dayes in Virgil, and two dayes in Tullie's Orations. They construed the Greek Testament into Latine, and the rest into English. "The seventh form went on with the Greek Grammar, forming at every part a verb Passive or Medium; they had their fore-noons Lessons in Isocrates, which they translated into Latine; their after-noon lessons were two days in Horace, and two days in Seneca's Tragedies; both which they translated into English. "In the eighth form Hesiod was read in the morning, while Juvenal and Persius were construed in the after-noon." At that time, as we have seen, boys usually went to the grammar school about six or at latest seven years of age, and entered at once upon the accidence. In his first year, therefore, Shakespeare would be occupied with the accidence and grammar. In his second year, with the elements of grammar, he would read some manual of short phrases and familiar dialogues, and these committed to memory would be colloquially employed in the work of the school; in his third year, if not before, he would take up Cato's Maxims and Aesop's Fables; in his fourth, while continuing the Fables, he would read the Eclogues of Mantuanus, parts of Ovid, some of Cicero's Epistles, and probably one of his shorter treatises; in his fifth year he would continue the reading of Ovid's "Metamorphoses," with parts of Virgil and Terence; and in the sixth, Horace, Plautus, and probably part of Juvenal and Persius, with some of Cicero's Orations and Seneca's Tragedies. In going through such a course, unless the teaching at Stratford was exceptionally inefficient, the boy must have made some progress in several of these authors, and acquired sufficient knowledge of the language to read fairly well at sight the more popular poets and prose writers, such as Ovid and Cicero. The masters of the school during the time Shakespeare attended it would seem, however, to have been at least of average attainments and ability, as they rapidly gained promotion. No fewer than three held the post during the decade from 1570 to 1580. In the first two years Walter Roche, for the next five, the most important in Shakespeare's school history, Thomas Hunt, and during the last three years Thomas Jenkins were head-masters in the school. About the time that Shakespeare's parents would be thinking of sending their eldest boy to school there seems, moreover, to have been a good deal of local activity in relation to the building, the old school-house having been put into thorough repair, and changes made in the internal arrangements for the purpose of rendering it more airy and healthful. In the chamberlain's accounts for the year 1568 mention is made of sums expended for "repairing the scole," "dressing and sweeping the scole-house," "ground-sellynge the old scole, and taking down the sollar over the school," expressions which warrant the conclusion that there was not only a school-house existing in the early years of our poet, but that it had even then considerable pretensions to antiquity. We may reasonably infer that as it had been put into repair in the year 1568, it continued in a state available for use until it was repaired again about the year 1594 or 1595, when the chapel of the guild was temporarily used, as it probably had been more than once before, instead of the school-house. The "sollar" referred to in this extract was a small story, in many cases a loft or garret; and taking away the sollar over the school-house would, I suppose, indicate that it was heightened and possibly newly roofed, as well as partially refloored. 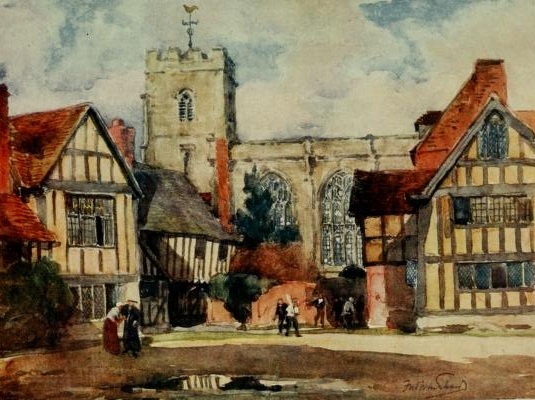 Shakespeare's father had been chosen town bailiff during the year in which these improvements were made, and it would be part of his official duty to inspect them during their progress and see that the work was well done. As a prosperous burgess and magistrate, he would be proud of the resuscitated foundation connected with the Ancient Guild of the Holy Cross, and now known as the "King's New School," and would naturally regard with special interest the renovated building where his son was soon to feel the magical touch of that lettered awakening which in a thousand diversified forms was everywhere quickening the latent seeds of genius into fruitful life. The new school in the old school-house was, indeed, at once the symbol and meeting-place not only of the two civilisations, the Classical and the Christian, which have determined the character of modern Europe, but of the two main currents of the latter, the Catholic and the Protestant, which are found united in the most brilliant and productive period of English literature. Baynes, Thomas Spencer. What Shakespeare Learnt at School. In Shakespeare studies, and essay on English dictionaries. London: Longmans, Green, and co., 1894. Shakespeare Online. 20 Aug. 2000. (date when you accessed the information) < http://www.shakespeare-online.com/biography/whatdidshkread.html >.